You may think twice about indulging in your Valentine’s chocolate after watching this short, to-the-point documentary about the unethical use of child labour on cocoa plantations. Danish investigative journalist Miki Mistrati travels to the Ivory Coast to delve into rumours that children are still being trafficked and sold to plantation owners, despite the 2001 Harkin-Engel Protocol—an agreement restricting the use of children to harvest cocoa beans that was signed by major chocolate companies. And although the chocolate manufacturers and government officials claim these rumours to be untrue, with a hidden camera and secret filming, Mistrati and Romano unveil that there is indeed a darker side to the chocolate industry. 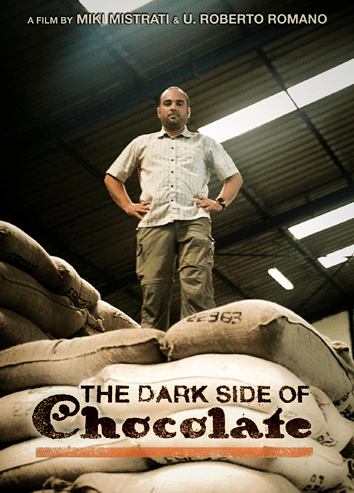 From shaky hidden camera shots on the dusty trafficking back roads bordering Mali and the Ivory Coast to the final bold scene at a chocolate manufacturer in Geneva, Switzerland, The Dark Side of Chocolate reveals that much more needs to be done to protect the rights of children.